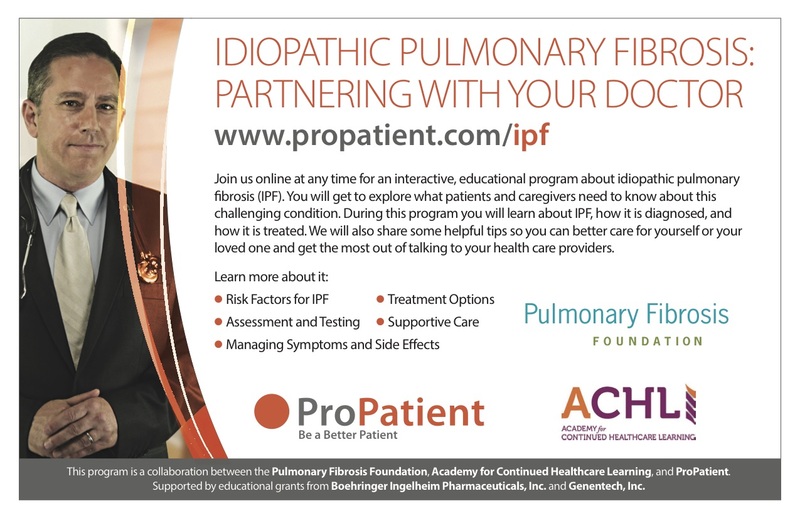 Hillsborough, NC, January 30, 2017	(Newswire.com) - ​​ProPatient, a provider of interactive online patient education tools, has teamed up with leading accredited medical education provider, Academy for Continued Healthcare Learning (ACHL), and the Pulmonary Fibrosis Foundation (PFF), to develop a new online resource for patients and caregivers living with idiopathic pulmonary fibrosis (IPF). IPF is a serious disease that usually affects middle-aged and older adults. Tissue deep in the lungs becomes thick and stiff, or scarred, over time. The formation of scar tissue is called fibrosis. As the lung tissue thickens, the lungs can't properly move oxygen into the bloodstream. As a result, the brain and other organs don't get the oxygen they need. Sometimes doctors can find out what's causing fibrosis, but in most cases, the cause is unknown. They call these specific cases IPF. IPF has no known cure. 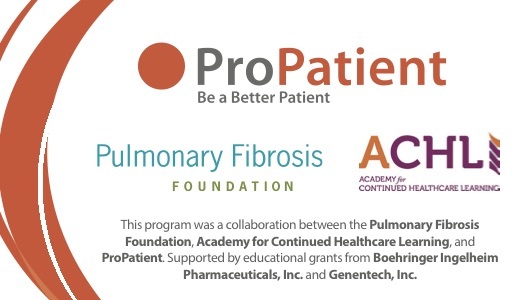 The program entitled, “Idiopathic Pulmonary Fibrosis: Partnering with Your Doctor,” provides essential information and tools for all learners, from those who have not heard of the disease to those undergoing treatment. It also includes strategies and best practices for communicating with healthcare providers. The Pulmonary Fibrosis Foundation mobilizes people and resources to provide access to high quality care and leads research for a cure so people with pulmonary fibrosis will live longer, healthier lives. The PFF collaborates with physicians, organizations, patients, and caregivers worldwide. “Our platform uses a combination of simulations and smart checklists to educate patients and caregivers, and also to help them get more from their doctor visits,” said JoAnne Schaberick, co-founder of ProPatient. The patient program and the associated activities for healthcare providers are available online and are free for all learners. ProPatient is a patient-focused, online educational platform that utilizes interactive video and engaging simulation to provide patients with the opportunity to ask questions of a virtual clinician and role-play different scenarios to improve their skills. The ProPatient mobile app is the companion app for your doctor visit, reminding you of the questions you should be asking during your doctor visit and providing checklists of items to consider in the event of a health condition or crisis. You are the CEO of your own health. You need to take Charge. We can help. For more information, please visit www.propatient.com. The Pulmonary Fibrosis Foundation mobilizes people and resources to provide access to high quality care and leads research for a cure so people with pulmonary fibrosis will live longer, healthier lives. The PFF collaborates with physicians, organizations, patients, and caregivers worldwide. ThePulmonary Fibrosis Foundation has a four-star rating from Charity Navigator and is a Better Business Bureau accredited charity. The PFF Summit 2017, its fourth biennial international health care conference will be held from November 9-11, 2017 in Nashville, Tennessee. For more information, visit pulmonaryfibrosis.org or call 844.TalkPFF (844.825.5733) or +1 312.587.9272 from outside of the US.